If you look hard enough you will find a non-league team closer than you think. Unless you live with one literally next door you can probably find one that you can walk to, or dare I say it, cycle. Of course there are always definitions as to what exactly constitutes a Non League team but to me I class it as one that could reach Wembley in the FA Trophy or Vase. TBIR Towers sits quite close to a number of clubs. Welling United isn’t more than a ten minute bike ride away, Bromley/Cray Wanderers a bit further (and a 314 bus ride) but there is one closer. And ashamedly I had never graced them with my presence. So with Lewes away on the other side of London in Harrow and me on a three-line whip to be hope by 5pm there was a perfect opportunity to hop on my Raleigh Grifter and cycle downhill all the way to my “local club”, Cray Valley Paper Mills. The reason why I had never seen them was that a) We do not live anywhere near Cray Valley, and b) There isn’t a Paper Mills near our house. How was I to know that they moved to Eltham some years ago but had never managed to shed the Paper Mills part of their name (and that the river Cray was now 6 miles away). 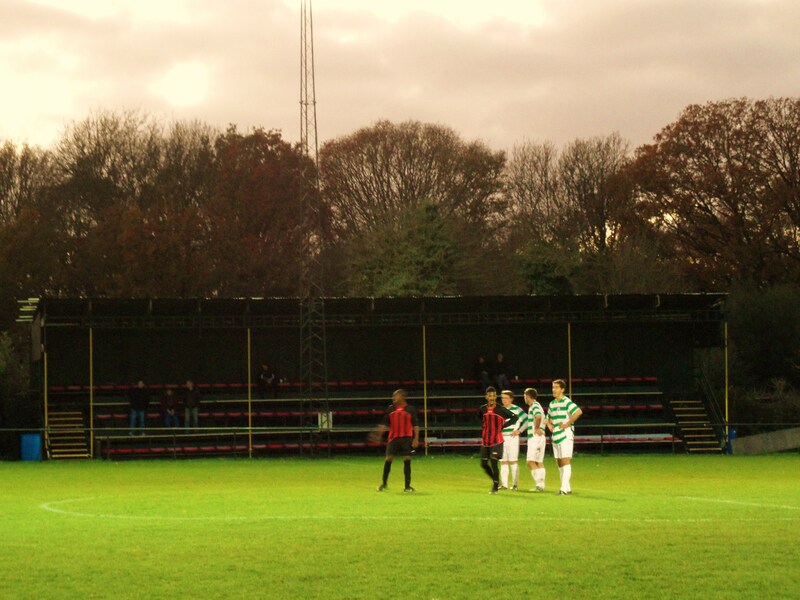 The club had been promoted to the Kent Premier League last season and were admitted to the level below the Ryman League despite the fact they didn’t have floodlights or stands. So having cycled passed the ground on dozens of occasions you can understand why I never knew there was a team playing there. But I was here to put that right. There always seems to be something cathartic about cycling or walking to a game. Almost as if you feel refreshed or pure. So heading down the Middle Park Avenue in Eltham with the wind in my hair I passed a car full of Charlton Athletic fans heading off to the Valley. I smiled, thinking of their pain shortly as they would fight for a space around the ground and then afterwards I would be home in front of the TV before James Alexander Gordon had fired up those legendary tones for the first time. Actually, because Cray Valley do not yet have floodlights it was a certainty I would be home by 5.01pm because they were kicking off at 2pm. The club seems settled on the Badgers Mount ground and plans are well underway to transform the site to host football at a higher level. As I cycled into the car park at 1.55pm I saw the new club house with its big screen TVs and Hürlimann beer. For those of you who do not know, the Kent Premier League is sponsored by the Carlsberg-owned, Swiss-produced lager. Quite what relationship the two brands have I do not know but who cares. Everyone is a winner, and as I slipped into the bar for a quick refresher after my cycle ride. Before my pint had been poured there was a ripple of applause from outside. “1-0 already?” I asked the buxom barmaid…..”no love, 2-0″… I looked at the clock – it was 2.05pm. How could I have missed two goals? I necked my pint and went outside, knowing my luck that there wouldn’t be anymore goals. 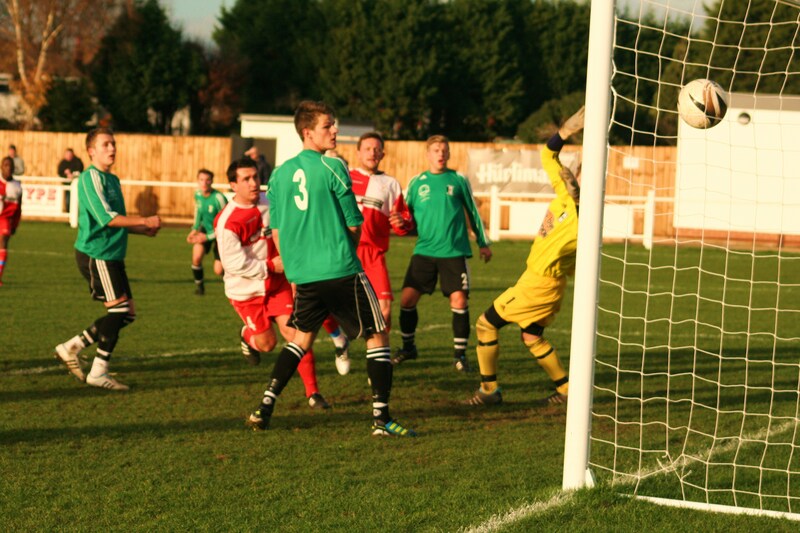 Cray Valley Paper Mills 4 Erith & Belvedere 2 – Badgers Mount – Saturday 3rd December 2011 I was wrong. This turned out to be a cracking game with four more goals. Allen and Tanner had given the home team a two goal cushion within the first few minutes but all of the running was being made by third place Erith & Belvedere. The Deres, as they are known don’t actually play in Erith or Belvedere. Erith Town play in Erith whilst the Deres play at Welling United. Clubs playing in places that have nothing to do with their name seems common in this league. 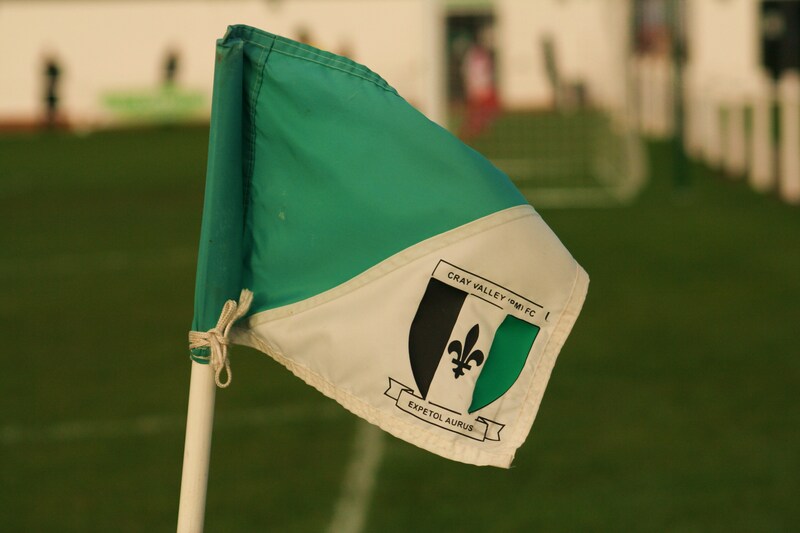 We have already mentioned Cray Valley, but there is also Greenwich Borough, who actually play in the Borough of Bromley, Woodstock who don’t play anywhere near Oxford and of course Corinthian do not play anywhere near the Peloponnese. 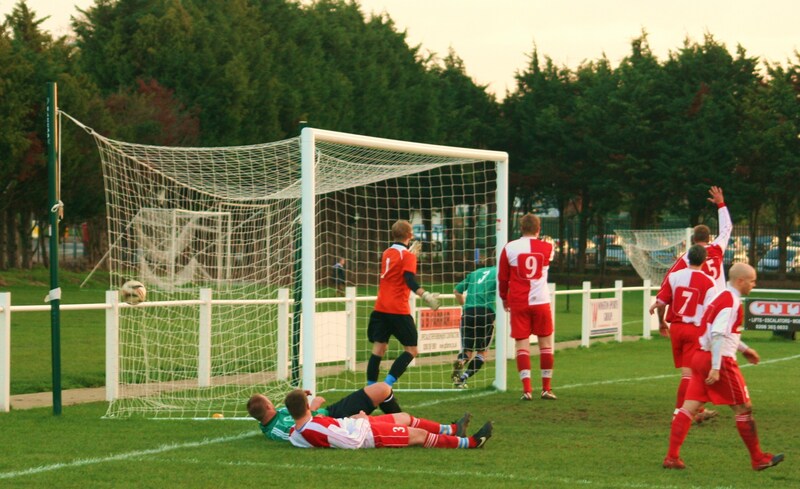 It wasn’t a surprise when Erith pulled a goal back when Evans headed home from close range. What then started happening was some ridiculous time wasting from the home keeper. Every time he got the ball he would dribble it from one edge of the area to the other, taking over 30 seconds in most instances. Pointless. 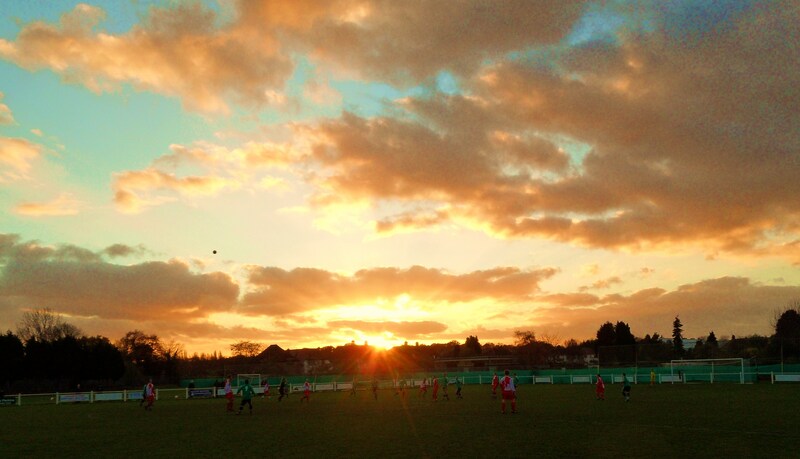 The second half saw the winter sun setting over the ground, shooting golden rays across the pitch. The bright light was affecting the Deres keeper who had forgotten to pack a cap and was having a bit of a mare in the second period. First he saw an effort from distance beat him all ends up, but the ball hit the underside of the bar. The third goal wasn’t long in coming when Knuckey scored on the hour and then three minutes later it was four when Springett headed in from close range. It is fair to say that the away team were mightily pissed off. They felt the officials had got three of the four goals wrong, and let them know about it. Little of the respect campaign was in evidence in the second half. They got a goal back with fifteen minutes to go when Constable scored, leading to one of those pointless rucks in the goal to try to recover the ball (Note to attacking team – the defending team still has to kick off so it is irrelevant how quick you get the ball back). It finished 4-2 to the home side, an upset on current form but deserved over the ninety minutes. The clock said 3.46pm. It was too tempting not to wasn’t it? Just fifteen minutes away was Oakley Road, home of Homesdale FC and their tenants Greenwich Borough, who were playing Corinthian. I could get there just in time for the second half. Should I? Could I? Well what do you think….. More photos from an excellent afternoon out can be found here.